Murders, harassment and disappearances. The reality of Latin American journalists in the XXI century Bernardo Díaz Nosty [CV] [ ORCID] [ GS] Chair professor of Journalism and Director of the Unesco Chair in Communication - Universidad de Málaga, UMA, Spain–nosty@uma.es Ruth A. de Frutos García [CV] [ ORCID] [ GS] Coordinator of the Unesco Chair in Communication - Universidad de Málaga, UMA, Spain – ruth.defrutos@uma.es Abstract Introduction: journalists in Latin America continue to face numerous threats in the exercise of their journalistic profession, which has increased the concern of the international community over its protection in recent years. 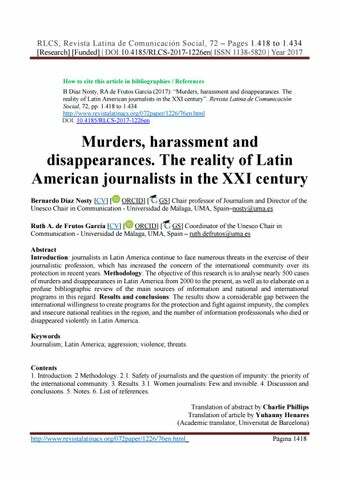 Methodology: The objective of this research is to analyse nearly 500 cases of murders and disappearances in Latin America from 2000 to the present, as well as to elaborate on a profuse bibliographic review of the main sources of information and national and international programs in this regard. Results and conclusions: The results show a considerable gap between the international willingness to create programs for the protection and fight against impunity, the complex and insecure national realities in the region, and the number of information professionals who died or disappeared violently in Latin America. Keywords Journalism; Latin America; aggression; violence; threats. RLCS, Revista Latina de Comunicación Social, 72 – Pages 1.418 to 1.434 [Research] [Funded] | DOI:10.4185/RLCS-2017-1226en| ISSN 1138-5820 | Year 2017 This international effort has not been corresponded with a reduction of aggressions towards information professionals, at least in Latin America, and neither with an increase of guarantees for the profession’s practice, as evidenced in deficits of national or international mechanisms of journalists’ protection. UNESCO adopted, in the meeting of the Executive Council on the past April 28, 2017, a new resolution about journalists’ safety and the issue of impunity, where all interested parties were demanded to double their efforts to guarantee professionals’ safety and stop the impunity of crimes against journalists. 2. Methodology The methods used to analyze the cases of murders and forced disappearances of journalists in Latin America from January 1, 2000, until June 30, 2017, is based on the search, contrast of sources and study of the victim’s data, the media he or she worked in and the possible causes of the aggression in a specific geographical context. The monitoring and in-depth description of this information, as well as juridical researches derived of said criminal actions, allow profiling trends in the perpetration of violence towards information professionals in each Latin American country Using as reference, the decision adopted by the Council of the International Program for the Development of Communication (IPDC) in 2014 and defined in the Journalist’s Safety Indicators: National Level, it is considered “journalist” and, therefore, analysis units for this paper, to "journalists, media employees and social media producers generating a significant volume of journalistic activity of public interest " (UNESCO, 2013: 2) in Latin America: Journalists are individuals that observe, describe, document and analyze events and document and analyze statements, policies and any proposal that may affect society, in order to systematize that information and gather facts and analysis to inform the sectors of society or the society as a whole (UNESCO, 2012) Even though the safety of media professionals is characterized by criminal deeds produced repeatedly from the south of Chile and Argentina until the north of Mexico, “the opacity, impact over media and creation of hostile situations for the professional practice” (Díaz Nosty 2016b: 86) hinder the task of tracing detailed information about cases. Often, the expansion of organized crime, corruption and prevalence of political expressions alien to the democratic culture hamper cases monitoring, with the disappearance of proof or the lack of rigorous and true statistics about individuals that have been victims of aggression during their professional practice (Díaz Nosty, 2016c). In front of this difficulty in data collection and the relatively scarce academic interest about such a relevant issue in the configuration of media systems in democracy (United Nations, 2017a, 2017b), it is mandatory to define methodological strategies that allow making the health status of press freedom in Latin America visible, as well as the situation of the protection mechanisms of journalists and the efficacy of the international effort for providing a critical multilateral system to the safety processes of information professionals. *Data of 2017 until June 30. Source: Observatory of Press Freedom for Latin America by Infoamérica. Authors’ own creation. *The item «sexual violence» was eliminated from the table because there was no incidence. Source: FLIP (2006-2017) Authors’ own creation. Source: C-Libre (2012-2016) Authors’ own creation. With 57 victims, Brazil is the fourth country with more journalists killed in Latin America. The political changes in the last years and the citizens’ protests have been widely treated in public, private and communitarian media, increasing the vulnerability of information professionals during coverages. The year 2015 was particularly outstanding, since nine information professionals died. Reporters Without Borders5 promoted the campaign during Olympic Games 2012 called “some victories do not deserve medal”, where the cases of Brazilian journalists murdered while in professional practice were reported. Among some of them, RSF reminded Gleydson Carvalho, journalist killed when some unknown individuals shot him on Radio Libertade FM 90.3 studios in Camocim, in Ceará State, on August 6, 2015. Another outstanding case in this campaign is that of the journalist Pedro Palma, director of the weekly newspaper Panorama Regional, murdered in his home on February 13, 2014, due to reporting corruption cases of Rio de Janeiro’s officers. Guatemala, with 32 deaths and disappearances of journalists during the 17 years studied also offers an environment of structural violence that directly impacts information professionals’ safety. The Centre of News Reports about Guatemala, Cerigua, started the campaign in favor of a protection program of journalists in 2011, “before the constant events of violence, threats, physical and verbal aggressions, as well as other violations of journalists’ rights in Guatemala”. On May 3, 2012, the Guatemalan government announced the enforcement of the program with numerous irregularities, as the organization itself complaints8, which have not avoided that aggressions against journalists continue (Graphic 1). Article received on 4 September 2017. Accepted on 6 November. Published on 17 November 2017.